Matt Bomer is going from "White Collar" to Hollywood icon. 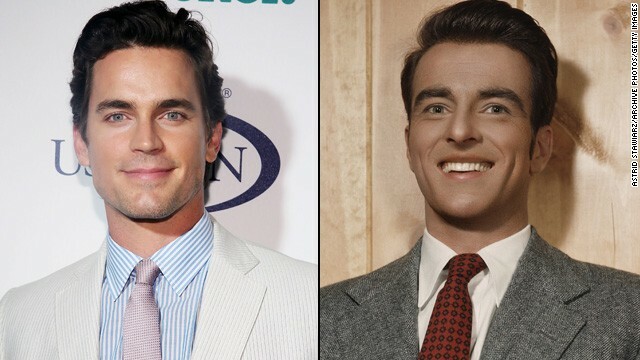 The 35-year-old actor is lined up to portray old-school film star Montgomery Clift in an upcoming biopic, Deadline reports. Bomer's reps confirmed the casting news to "Entertainment Tonight." The film, called "Monty Clift," will be written by Chris Lovick and directed by Larry Moss. The portrait is expected to capture Clift, whose career includes classics like "Red River" and "From Here to Eternity," at a young age when he was working on 1951's "A Place in the Sun." The script will reportedly focus on Clift's romantic feelings for Elizabeth Taylor following that film. Although Bomer's film career isn't quite as long as his TV resume, he's still a popular casting choice with fans. The "White Collar" actor was the top choice to take on the character of Christian Grey in the upcoming adaptation of "Fifty Shades," but he's said that he's content with the role going to "Sons of Anarchy" actor Charlie Hunnam instead. This is a more interesting role for Matt than CG. Maybe Alexis B. can play Elizabeth Taylor. Find it strange that they talk about Monty's 'feelings' for Liz Taylor. It is a well know fact that Monty was gay and he and Liz were BFF's. Not innuendo or rumor...but stated by Liz herself and well known throughout Hollywood. Hope they don't take liberties with the truth here to make it more bankable. Looking forward to the biopic! Matt is going to be great. His boyfriend – Simon Halls – has seriel killer eyes! Ima gonna be having nightmares for weeeeeeks! Can't they find some gay characters for that sausage muncher to play? Maybe a little research before you post ignorant h0m0phobic tripe on here, you moron. If there weren't any but pirates, there would be fewer chicks for me to bang. He was banging Liz taylor. Can't they find a hole for you to crawl into;you sub-life cretin? Perfect! They are not only blessed with perfect looks, but both have a passionate, genuine personality. Matt is a method actor and I know he will give it his all and do justice to this complex role. They both look like wax sculptures. Too clean cut. Not real men. U like Dwayne The Bounty Hunter. Pig. No, actually, I don't. Pig. The one on the left is yummy. The 1 on the right is dead. But i'd still do him.